At List Now Realty, we make it easy to list your home on the MLS in Florida. Our simple pricing, attention to detail, and exceptional customer service ensure you get the most for your money. If you’re wanting to list your house on MLS in Florida, keep reading below or contact us to find out more! Listing on the MLS without a Realtor in Florida has never been easier! You get everything for only $299. No nickel and diming, no hidden fees, no “add-ons”, no upsells. List your property on the local MLS and hundreds of partner sites until it sells or until you tell us to take it off. Make as many changes as you need and add as many photos as the local MLS will allow. You’ll even have access to a licensed Florida real estate broker if you have questions or need advice. Others may charge less, but they can’t match our level of service! Have questions about an offer or need some professional advice? Shoot us an email or schedule a call with the broker – all at no additional charge! We even have a live person to answer calls from buyers and agents on nights, weekends, and holidays. Calls are answered live Monday through Friday, 8am-Midnight and Saturday and Sunday, 9am-9pm and the caller is provided with your contact information. Other companies just send calls to voicemail! We also forward all email inquiries to you during normal business hours. Your property needs to be listed on the correct local MLS in order to get maximum exposure. If more than one MLS covers your area, your property needs to be listed in both. We take care of that for you. Unlike the big national companies, we have actual access to each MLS in the markets we serve. We know the areas and we know exactly where your property needs to be listed. We offer unlimited changes, unlimited photos, and unlimited time on the MLS. Believe it or not, some other companies charge for this stuff. Not us. If you need to make a change, you can do it without having to whip out your credit card. You can also add as many photos as the MLS allows (not all MLS are fans of unlimited). Ideally, your property will sell quickly, but if not, we’ll let you renew your listing contract as many times as you’d like at no extra charge. Don’t be fooled by the other guys! There are a lot of choices when it comes to listing your house on the MLS in Florida. Not all flat fee MLS companies are created equal. Don’t be fooled by “too good to be true” pricing or websites claiming they have national MLS access. The cut-rate guys can’t match our service and there is no such thing as national MLS access. We’re all about saving money, but save it where it matters! 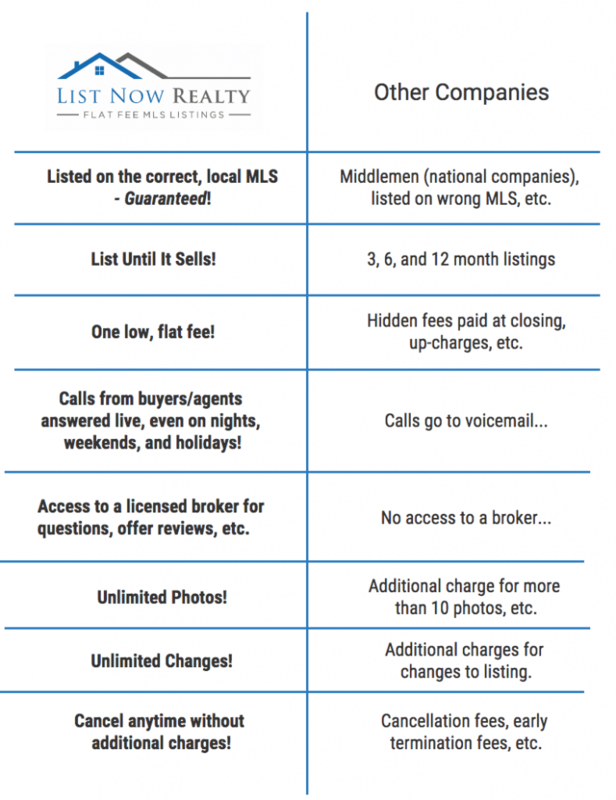 Here are some other things that make us different than other flat fee MLS companies. All of this for only $299!